beginning at 7:30am on Wednesday, April 24th! Seeking clarity on the ethics and legal issues that surround data handling for AI in Radiology? Join us for this free, one day summit, bringing together bioethicists, legal experts and imaging experts to address these pressing questions. Artificial intelligence is a paradigm shifting force across many fields including medical imaging. Radiology is one of the most data-rich medical subspecialties and leading academic and industry groups are already working to leverage this powerful tool to move our field forward. Research and implementation of AI in Radiology moves us into unchartered territories, raising new questions with regard to best practices for data handling. We will hear from ethicists with regard to AI in the framework of ethical principles and privacy considerations. Law experts will discuss regulatory issues, how to handle intellectual property and more. Radiology stakeholders from diverse practice settings from academia to private practice as well as industry will voice their perspectives. Finally we will present and discuss two white papers currently under works-in-progress from the American College of Radiology (ACR) and Stanford University. We hope you’ll be able to join! 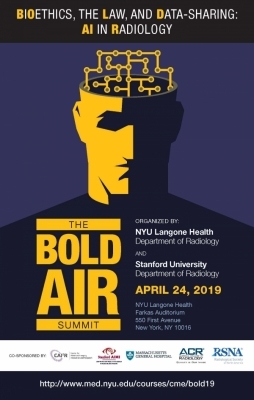 This summit is organized by the Departments of Radiology at NYU Langone Health and Stanford University School of Medicine. We are pleased to announce that meeting registration is complimentary! click here to view the printed brochure as a pdf file.